I'm back with some news about the game. I've recently finished porting the UI to Unity 4.6 (Actually, I had to build everything from scratch) and added multi-language support to the game. It's been a really long time since the last update (I think almost 3 months) and that's because I started to study back in October. While I still had time to work on the game in October, I was busy in November and December so things got delayed. Instead of just posting a long list of things that have changed, I think it is best to show you the key parts and to give you some background info (most changes are in the background). First, I have to say that the new UI system in Unity 4.6 makes everything much easier and that it will be much faster to implement new UI elements in the future. So let's begin with the menu. It looks quite similar to the old one with some minor changes. Most changes happened in the multiplayer menu. 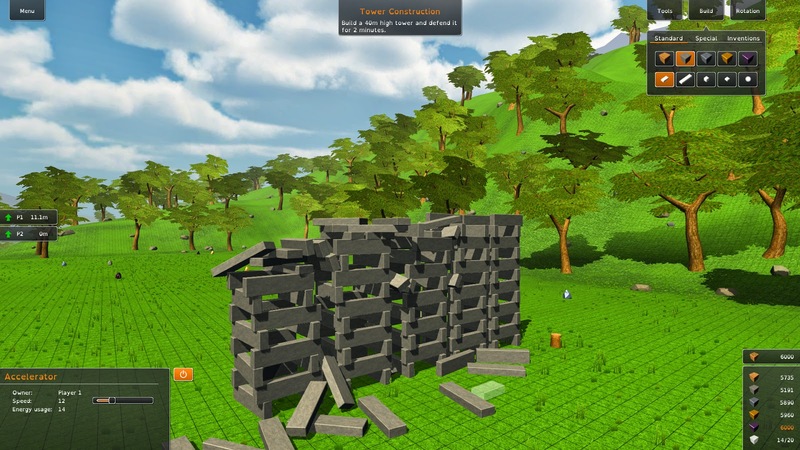 The server creation looks more structured now and gives some information about the game modes. 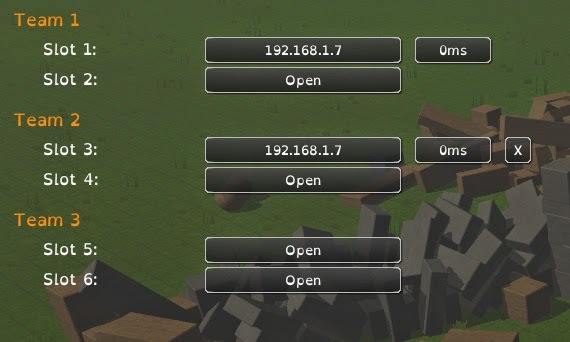 Furthermore, I adjusted the server list and the "player-slot" menu, which you see all connected players after you created a server. Besides that, there were some smaller changes like better font sizes (the old ones were too big in most cases). The new menu also adjusts its size according to the screen. Something I already mentioned before is the support for multiple languages and community translations. Building this system took a lot of time but I think it was worth it. All text components are now saved in .xml files in a specific directory. So you might have an english.xml in that folder which contains all texts in English. If you want to add another language to the game, you can search if somebody already made a translation and save that file into the folder. You can also create your own translation by copying an existing language file and edit it with a text-editor (there will be a detailed description about how to do that but it's actually quite easy). So now let's take a closer look at the game UI. 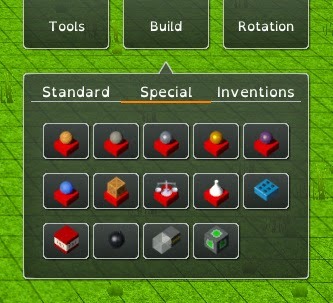 As you can see, there are several changes to the UI. In each level (single- and multiplayer), there is a label at the top of the screen, which tells the player what the goal of the level is. This might be a longer text, so if the label gets too big, it automatically collapses and opens again if you move your mouse cursor over it. Another change is the menu in the top right corner. 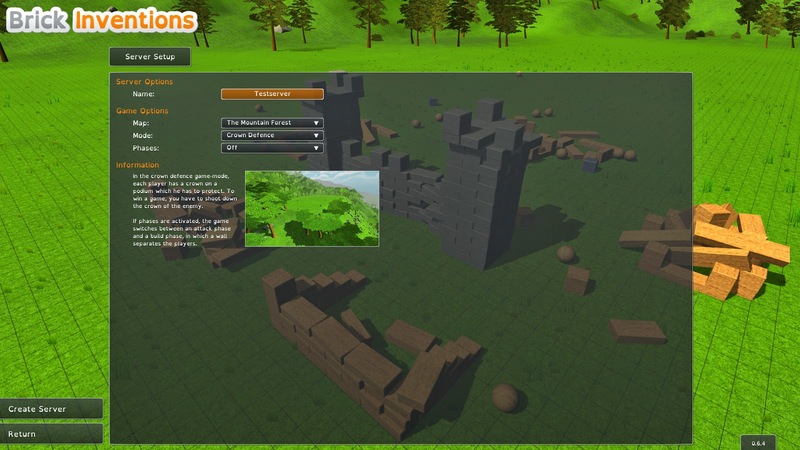 Especially the "build" menu has changed, as I wasn't happy with the way it worked before. 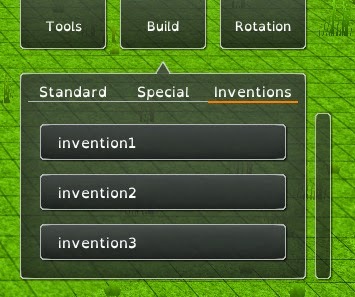 The buttons are bigger, it has three tabs for standard blocks, special blocks and inventions and looks much cleaner now. Furthermore, I adjusted the resources into on block at the bottom left corner and added a label for the total warehouse capacity. 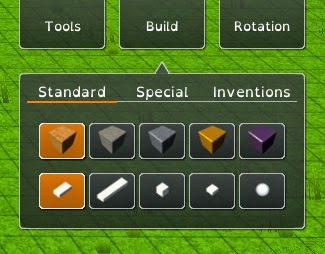 In the new version, the management menu has sliders to adjust several values (e.g. speed of accelerators, delay of triggers). There have been many other changes (for example, I optimized some scenes and the draw calls went down from 1200 to 500) but like I said, most things changed in the background. I am quite happy that the UI is complete now and that I can work on more awesome stuff again. So what's going to happen next? Unfortunately, I won't have much time to work on the game in January due to exams so it might take a bit longer until there are more news. What I am focusing on right now is to finish the multiplayer sandbox (which only needs a menu to be finished) and the rocket-block. Besides that, there will be more options regarding the camera movement and shortcuts. In the coming weeks, I will also upload the last part of the game-play series about the multiplayer. That's it for now, if you have any feedback or questions, don't hesitate to write a comment below.